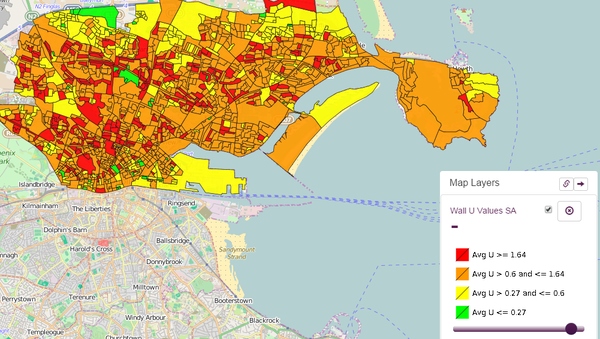 The Irish pilot action is focussed on the Northside of Dublin City. Energy Performance Certificates (EPCs) or Building Energy Rating certificates are already available for 40 % of dwellings nationally via the national EPC database. At February 2015, EPCs were available for 40,797 dwellings within the selected pilot action stock and these provided a valuable data source for this study. The aim of the pilot action was to establish the current energy status of the stock, the refurbishment conducted to date, the current annual refurbishment rates and to assess the current and predicted trends against the national targets set for 2020, 2030 and 2050. The national target is to reduce CO2 emissions from 1990 levels by 80 % by 2050. The National Energy Efficiency Action Plan set an energy efficiency saving target of 20 % by 2020 from the average unadjusted final energy consumption 2001-2005, expressed as primary energy equivalent. Three key data sources were used to analyse the building stock and its refurbishment status and rates. National EPC database: This EPC database forms the key data source used for the pilot action. EPISCOPE Field Survey: A field survey was conducted to cross-check the refurbishment rates that emerged from the EPC database analysis. 100 dwelling surveys were completed. Energy efficiency upgrade programmes: Trend data was obtained for two national energy efficiency programmes that have been in operation for more than 5 years. Trend Scenario: based on energy use predicted from the current EPC Database, calibrated to reflect measured energy use. It assumes that the existing stock will continue to be refurbished at the aggregate rates (from EPC analysis and field survey) and that 1,000 new dwellings built to the NZEB standard will be added to the stock each year. Scenario B: assumes 25 % of the stock will have undergone a deep retrofit by 2050 by adopting ambitious fabric upgrades and switching to renewable technologies. It also assumes that the carbon content of the electricity supplied will have been reduced by 30 %. Scenario C: assumes 75 % of the stock will have undergone a deep retrofit by 2050 and that the carbon content of the electricity supplied will have been reduced by 60 %. Neither the Trend Scenario nor Scenario B will meet the 2020 or 2050 targets. Scenario C will meet the 2050 target of an 80% CO2 reduction (see table). Also, energy demand would be reduced by 65 % from the 2005 base level with an average EPC rating of 66 kWh/m2/annum. The Irish pilot action also explored how mapping EPC data can assist in retrofit strategy development and planning. The EPC mapping tool is available at energyaction-static.s3-website-eu-west-1.amazonaws.com/index.html. More than 20 mappings views have been created – see example of the wall U value map.